Tooth, Odontoblast - Degeneration in a male F344/N rat from a chronic study. 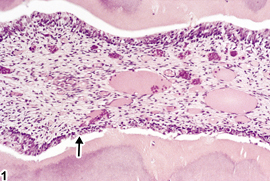 The odontoblasts are small and disorganized (arrow). 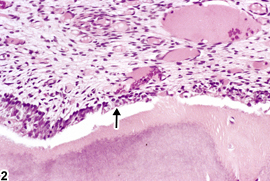 Tooth, Odontoblast - Degeneration in a male F344/N rat from a chronic study (higher magnification of Figure 1). 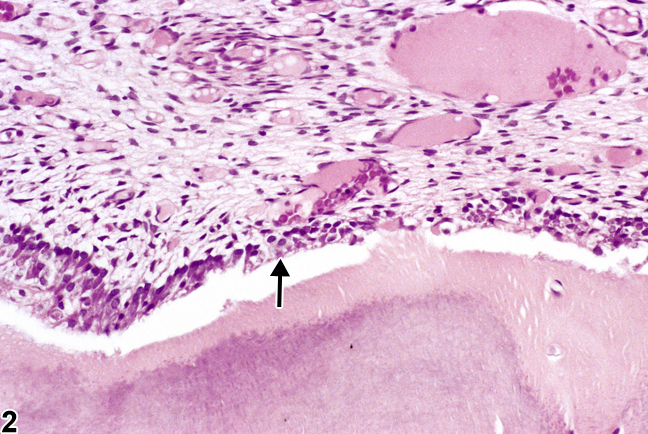 The odontoblasts are small and disorganized (arrow). Fluoride toxicity is the most well characterized cause of odontoblast degeneration ( Figure 1 and Figure 2 , arrows). Odontoblast degeneration is characterized by decreased amounts of cytoplasm, decreased cell numbers, disorganization of the epithelial cell layers and lack of nuclear polarity in cells. It may be focal or diffuse. Degeneration of the odontoblasts affects their ability to produce dentin and may result in focal to diffuse dentin hypoplasia or aplasia, which causes variations in the thickness of the dentin. Published reports of such effects in mice are uncommon. Odontoblast degeneration should be diagnosed and graded based on the degree of degeneration and the number of odontoblasts affected. Alaluusua S, Lukinmaa PL, Pohjanvirta R, Unkila M, Tuomisto J. 1993. Exposure to 2,3,7,8-tetrachlorodibenzo-para-dioxin leads to defective dentin formation and pulpal perforation in rat incisor tooth. Toxicology 81:1 13. Bucher JR, Hejtmancik MR, Toft JD, Persing RL, Eustis SL, Haseman JK. 1991. Results and conclusions of the National Toxicology Program’s rodent carcinogenicity studies with sodium fluoride. Int J Cancer 48:733-737. Kiukkonen A, Viluksela M, Sahlberg C, Alaluusua S, Tuomisto JT, Tuomisto J, Lukinmaa PL. 2002. Response of the incisor tooth to 2,3,7,8-tetrachlorodibenzo-p-dioxin in a dioxin-resistant and a dioxin sensitive rat strain. Toxicol Sci 69:482-489. Kuijpers MHM, van de Kooij Aj, Slootwig PJ. 1996. 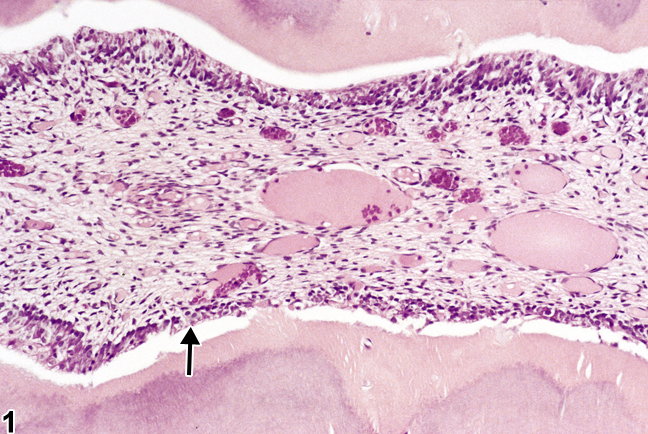 The rat incisor in toxicologic pathology. Toxicol Pathol 24:346-360. Maurer JK, Cheng MC, Boysen BG, Squire RA, Strandberg JD, Weisbrode SE, Seymour JL, Anderson RL. 1993. Confounded carcinogenicity study of sodium fluoride in CD-1 mice. Regul Toxicol Pharmacol 18:154-168.